Now there is help for men recovering from Prostate surgery, frequent urination problems and other urological problems associated with male incontinence. Afex™ is the ideal solution for male incontinence! It completely eliminates the need for external catheters and protects against skin breakdown. Afex™ offers the quality of life experienced before incontinence; and, the confidence and security desired while incontinent. Afex™ users can continue to enjoy fishing, golfing and other activities comfortably, discreetly and without worry. This Afex™ Collection Bag attaches to the Afex™ Receptacle easily with its "turn-n-click" feature, eliminating the need for tubes or straps. Two convenient stabilizing tabs at the bottom of the bag that attaches to the Afex™ Briefs, are available if needed for additional stability. 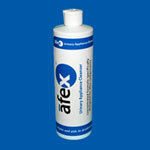 The latex free Afex™Collection Bag is made with a double-seal to contain odor and holds up to 16 ounces (500 ml). It features a one-way flapper valve which eliminates backflow even if the bag is compressed or elevated. A "one-touch" horizontal port is added for simple and easy drainage. Choose from two sizes: 16 ounce (500 ml) and 32 ounce (1000 ml), ideal for traveling long distances, sitting for long periods of time, and overnight use. A Vented Style Collection Bag is also available, and it's designed to eliminate air build-up inside the bag. The Vented Style is available in 16 ounce size only. 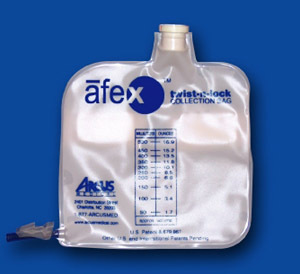 With proper care, the reusable Afex™Collection Bag can last up to six weeks. Afex™ recommends regular cleanings with the Afex™ Cleansing Solution, a specially formulated solution to safely clean and eliminate odor. 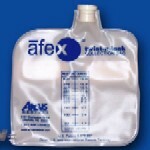 In order to use the collection bag effectively, the Afex™ Incontinence Management System Starter Pack is required. Included in the starter pack is an informative video to assist Afex users with directions on proper use and care. All of the starter pack's components can be purchased separately as replacements and additions to help manage male incontinence.